Presently, the way it is established is the Realtor presents the home staging concept and that the homeowner would be paying for the services up front and would be getting 1/2 of the staging costs back at closing. If the homeowner doesn't want the service it is declined and I don't ever get into see them. I know I have lost a couple of homes this way. I realize I might have never gotten the clients but I didn't have the opportunity to share from my perspective which might have given them a new outlook and a willingness to spend the money. This is the change I want to do. I am going to request that the Realtors make an internal assessment and if they think my services would be useful, they merely inform to homeowners that this service is available, hand them my brochure and tell them I would be in touch to set up a meeting and discuss their options. Well, it's always best to pitch your services yourself, but I'm not quite sure that relying heavily on a brochure is the answer, but you're on the right track. What I would try to do first is to work with the agents on the type of pitch they are making to the homeowners. Their own personal enthusiasm and the way they promote you is critical, whether you provide a brochure or not. If they are not wholely enthusiastic and compelling, the brochure won't likely overcome their lack of purpose. A brochure, or even a postcard, is essential because the home seller can "see" something. Most people are visual learners, so having something to "see" and "touch" is very important. The brochure should also be very benefit driven, full of before and afters. You'll also want it to convey the importance of getting an outside opinion by a seasoned professional, such as yourself, and reassure them that they don't have to do all or any of the work themselves - that you'll manage everything for them in a timely manner. Then, by all means, follow up yourself! Always try to keep the initiative yourself. Many people mean to respond but just never get around to it, so you have to dog them, so to speak, in a polite and professional manner. Barbara Jennings is one of the foremost authorities on interior redesign, home staging and art consulting. She trains entrepreneurs from all over the world through her online tutorials and books. 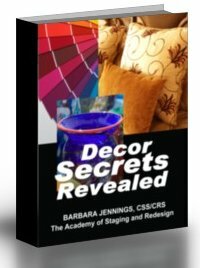 Author of 9 books for the decorating and design field, she is widely respected for her expertise and affordable training programs. Add our Blogs to Your Favourites List. NEW HOME STAGING TRAINING IS HERE! TESTIMONIAL - "Barbara - Thanks very much for your responsiveness and excellent customer service in addressing this item. I truly believe that successful businesses demonstrate effective customer service and you are an outstanding role model. - Betty Robinson"